Are you planning to make a documentary or you already have made one but you wonder how the hell you can get back all the money you invested to shoot it? Or better, do you know that you could make a profit making documentaries? In 5 keys Guidedoc gives you a strategy that will help you make money with your documentary. The most important thing for a movie to have a profit is that it counts with a potential audience to watch it. For this reason, the first thing you should do is to know what kind of documentary you are making. It is not the same thing making a commercial documentary with a light and pedagogical narrative that attracts a wide audience than to make an essay or authorial documentary, where the aesthetic features are freer but the target audience is more specific. Both approaches are valid but differ in the audience segments they can address. In theory, the first case is more likely to be commercialized, but with new ways of reaching specific niches (for example the audience of festivals and art films) through categories arranged on streaming platforms such as Guidedoc, independent films have more opportunities to be discovered by their ideal audience. The most significant example of the latter case is Alfonso Cuarón’s Roma an Art film (not a documentary) whose distribution rights were sold to Netflix for a record amount. If the profile of your documentary justifies it, it is a good idea to try to make your film known, even before the shooting, to as many people as possible before the launch. Crowdfunding campaigns have proven to be a very efficient way to attract followers on social networks who then become potential viewers of your movie. If they already like your project they could be willing to buy a movie ticket or subscribe to the streaming platform (like Guidedoc) where the film is available. An example of this kind of strategy is Aaron Lieber’s documentary “Bethany Hamilton: Unstoppable” The film was funded through Kick Starter and premiered at the Tribeca Film Festival in 2018. If you perceive that the theme of your documentary may interest a broadcast window that wants to take it to the screen it is good to knock on that door. Television channels and streaming platforms such as Netflix or Amazon Prime are always looking for original stories to bring to their subscribers. This year there is no better example than the documentary "Free Solo", an idea that was purchased by National Geographic. The American cable channel financed the entire production and prepared a successful distribution campaign that allowed the film to earn more than $ 18 million in profits and obtain the Oscar for best documentary feature. There are basically two ways to make your film known after it is made: reach an agreement with a distributor or distribute your documentary yourself. The first option will allow you to have the advice of experts and professionals from the film industry who handle the statistics and know the right people. In addition to the largest distributors there are also independent options, emerging companies that have managed to position documentaries in important festivals and then sell the broadcast rights to TV channels or streaming platforms. If you go for the option of distributing your film yourself, you will have more freedom and more profit, in theory, but it will also include more work. Do not stop reading the next key. After the film festivals, your film has an unparalleled option to stay alive and available to a worldwide audience through the new streaming platforms. As we said in the beginning, the most important thing is to know what is your ideal audience, this information will help you a lot to find the best place to host your movie. 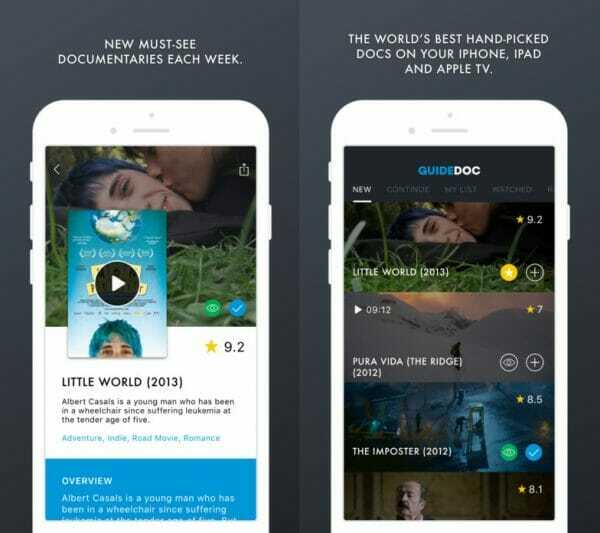 In our case, Guidedoc is a streaming platform exclusively for documentary films created for documentary lovers who want to enjoy a wide range of award-winning films. An agreement like the one offered by Guidedoc allows you to make your film available in the online catalog for free, obtaining profits through the number of reproductions your documentary has for an indefinite number of years. Could you imagine ageing and still receive money for people who watch your documentary online? Well, now there's nothing stopping you.